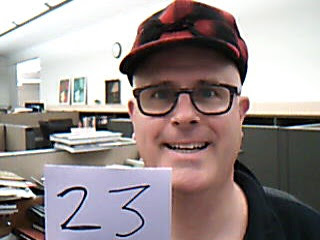 Day Twenty-Three / Hat Twenty-Three: Stormy Kromer Mackinaw Cap (100% wool exterior, 100% cotton lining, "made in U.S.A. in Upper Michigan's Upper Peninsula of Imported Parts"). Look for more from her collection for the NC Series in the coming days -- except for her turkey hat -- because I've got the same one and I'm hoping we'll BOTH wear them for a Project Cubbins entry closer to Thanksgiving. Noelle, I tip my head furnace to you.